Ready Harris News: Best Friends Animal Society and Harris County Public Health Team Up to Open Pet Reunion Pavilion in Wake of Hurricane Harvey - Houston Pets Alive! Houston, TX (Sept. 11, 2017) — Best Friends Animal Society is excited to announce the opening of the Pet Reunion Pavilion. Harris County Public Health’s (HCPH) Animal Shelter secured the facility and expedited the creation of a center where families separated, from their pets during or following Hurricane Harvey, can come search for their four-footed family member. Other important partners in this unique facility are Austin Pets Alive!, Houston Pets Alive!, and Houston PetSet. 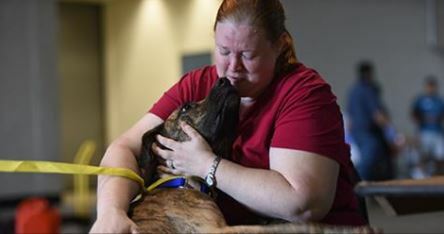 Austin Pets Alive!’s Katy location will move into the NRG Park for this initiative. Best Friends will work to continue reunions with pets that have been separated from their families. Located at the NRG Arena in Houston, the Pet Reunion Pavilion will act as a hub for families to find their pets displaced by Hurricane Harvey. If a lost pet is found, it is recommended to first take the animal to the local shelter, where it is most likely to be reunited with its owner. “I would like to thank Best Friends Animal Society for their efforts in setting up this Pet Reunion Pavilion and Harris County officials for providing the facility for us to use,” said Dr. Mic. “One of our primary goals in the wake of the storm is to ensure pets are reunited with their families,” said Brent Toellner, incident command for Best Friends Animal Society. “Staging an area in Houston is a priority for us as we want to make it as easy as possible for happy reunions. “Following our Rescue and Reunion Center in Montgomery Country, we’re furthering our work in the area to help the animals affected by Hurricane Harvey and are opening this collaborative operation based at NRG Arena in Houston,” Toellner said. Houston PetSet will provide space and resources for smaller local organizations that have been involved with Hurricane Harvey rescue. “Through this collaboration we are able to extend our support of the animal rescue community in the Greater Houston area by linking needs to resources through our local and national partners. The smaller, grass-roots and volunteer-based nonprofits have and will continue to play a vital role in animal rescue and reunification efforts and Houston PetSet is committed to supporting them both at the Pet Rescue Pavilion and long after,” said Tena Lundquist Faust and Tama Lundquist, Co-Presidents of the Board of Directors for Houston PetSet. Hours open to the public: 10 a.m. to 7 p.m.
*NOTE; Pet Reunion Pavilion will be closed to the public on the following Sundays: Oct.1, Oct. 8 and Oct. 15 when the Houston Texans are playing home games. It is also important to search on the local municipal shelters’ websites and on PetHarbor.com.